Change your perspective with the Yuneec Q500 aerial photography and videography (APV) system. The system arrives 100% factory-assembled and test flown including the 3-axis CGO2+ that records full HD 1080p video and takes 12 megapixel still photos. And the built-in digital video downlink delivers streaming video that can be viewed right on the screen of the included ST10+ transmitter and Personal Ground Station. With the Q500 it’s never been easier to capture amazing photographs and video footage for a wide variety of uses. 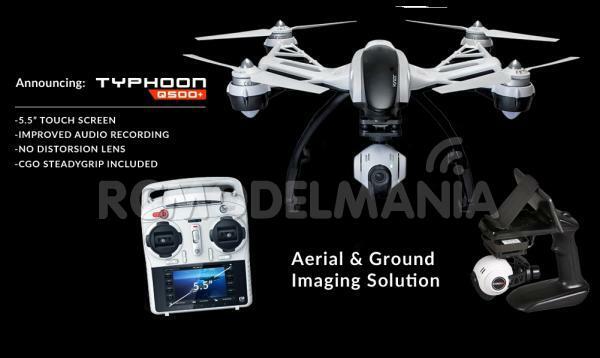 The Q500 Typhoon is a complete aerial photography and videography (APV) system that records full HD 1080p 60 FPS video and takes 16 megapixel still photos. The Q500 arrives 100% factory-assembled and test flown, so it is “ready to fly” out of the box. The Q500 includes the aircraft, a 1080P HD camera, a CGO2+ 3 axis precision gimbal, the ST10+ personal ground station, 2 batteries, a charger and an 8GB microSD card. In addition, there are a number of accessories including a sun shade, car charger, USB adapter/charger and an extra set of 4 rotors. The ST10+ personal ground station is a 10-channel 2.4GHz RC transmitter that supports a 5.8GHz video downlink that delivers streaming video to the built-in screen of the transmitter. 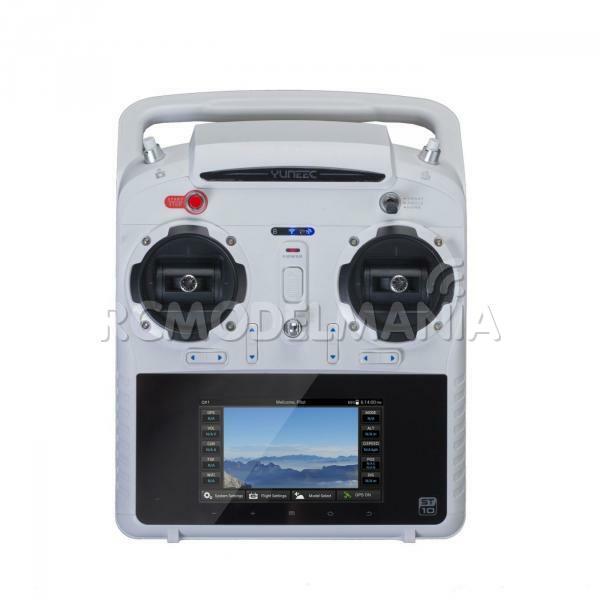 Real time telemetry data available on the screen during flight includes flight mode, altitude, speed over ground, distance from home, camera frames per second (FPS), GPS position coordinates, number of GPS satellites available and aircraft battery status. Once the Q500 Typhoon is in the air it is really fun to fly. It has three modes to choose from–known as Smart, Angle and Home – depending on your skill as a pilot. Each mode is intuitive and easy to grasp. Smart Mode is for new fliers, as it uses the drone’s built-in GPS to establish a 26 feet (8 meters) diameter “SAFE Circle” around the pilot. In Smart Mode, the Q500 will always move in the direction the control stick is pushed relative to the pilot. If you push the stick to the left the Q500 will always move to the left, regardless of the direction the nose is pointing. In this mode, the Q500 will also hold its position and maintain a level attitude when the control stick is centered. Finally, there is also a “geo-fence” or virtual ‘barrier’ that will keep the Q500 from traveling farther than 300 feet (91 meters) from the home or takeoff position. Pilot or Angle Mode is all about aerial videography. It is the mode preferred by experienced RC/drone pilots because the Q500 will move in the direction the control stick is pushed relative to the front/nose of the aircraft. It also gives the pilot more control authority by turning off the SAFE Circle and allowing steeper bank and pitch angles. This makes it possible to get faster panning and tracking shots when you’re shooting high-energy, action video. There is no “geo-fence” in Pilot Mode so the aircraft will fly to an altitude of 400 feet above ground level, which is the maximum altitude allowed by the Federal Aviation Authority. Home Mode is a safety feature that can be activated at any time with the simple flip of a switch. When activated, the Q500 Typhoon will automatically return to its “home point” and land within a 10 feet circle (3 meters) of where it took off. It’s great for first-time flyers who aren’t quite ready to land the aircraft themselves or experienced pilots who lose sight of the aircraft. If for whatever reason the transmitter signal is lost, Return Home will take over and fly the Q500 back to you until it lands or the signal is restored. While the Q500 offers a superior flying experience, it is the quality of the video and still images that sets it apart. The CGO2+ combines a 16 megapixel, 1080p/60FPS camera and a 3-axis brushless gimbal into a single unit that captures smooth, steady aerial video and still images in vivid detail. A built-in 5.8GHz Wi-Fi link lets you control the camera and view streaming video of your flight on the screen of the ST10+ personal ground station. You can choose to record video at 48, 50 (PAL) or 60 (NTSC) frames per second by tapping the corresponding button on the screen of the ST10. A slider located on the left side of the ST10+ allows you to set the pitch/tilt position of the CGO2+ from straight ahead to straight down or any position in between. With the Q500 Typhoon it’s never been easier to capture amazing photographs and video footage for a wide variety of uses. 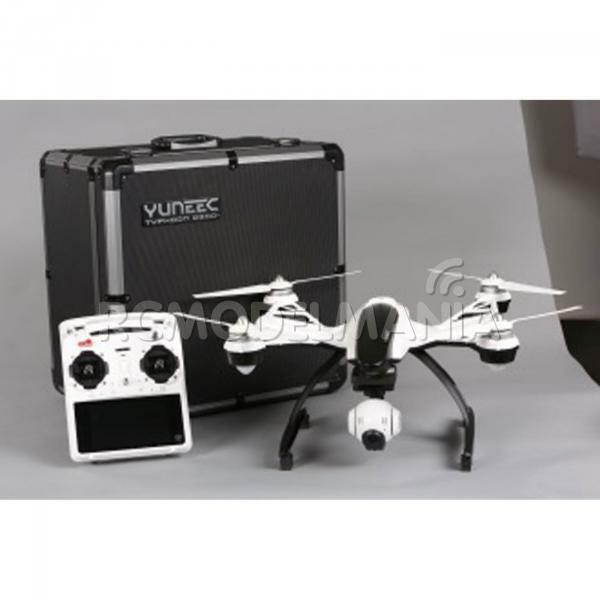 With nearly two decades of experience in developing Radio controlled and manned aircraft, Yuneec’s engineers have delivered the extended flight time, ease of operation and reliability you’ve been looking for in an aerial video solution.